By swapping out a few ingredients and increasing the amount of fruits and vegetables in a couple of simple dishes, you can drastically cut the number of calories and amount of fat you’ll consume. And you can add more good stuff, like fiber, vitamins and minerals. 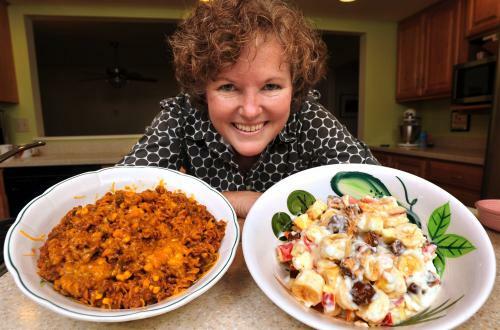 Registered dietitian Susan Kundrat uses healthier options of some standard dishes as recovery meals for the University of Illinois athletes with whom she works. She suggests diets to help them with recovery from hard workouts, minimizing injuries and maintaining strength for their sports. The dishes can also work well for the many people who focus on eating a more healthful diet early in the year, after the indulgences of the holidays. “The New Year is a good time to refocus on produce. At the end of the year, we’re eating a lot of starch — potatoes, bread, cookies and desserts,” said Kundrat, who is also a certified specialist in sports dietetics and president of Nutrition on the Move, which offers nutrition consultation and planning and is based at Strawberry Fields in Urbana. Kundrat works with clients, many of whom are either trying to lose weight or need to adjust their diets because of issues such as gluten intolerance. She suggests adding extra fruits and vegetables at every meal to replace some of the heavier foods and sweets eaten during the holidays. “You don’t get out of that rut when you don’t make a conscious effort to do something else,” she said. When she teaches athletes about nutrition, she emphasizes how to put foods together to get the most benefit from them. For example, in her South-of-the-Border skillet dinner, the vitamin C in the peppers and tomato sauce helps the body absorb the iron in the meat and whole-wheat pasta. Kundrat talks with clients about satiety — foods with enough volume that help them feel full, but which are lower in calories. They include fruits, vegetables and soups such as vegetable, minestrone, chicken noodle or others with clear broth. People who eat a bowl of soup once a day usually consume fewer calories per day because the soup fills them up, she said. One way to increase the amount of fruit and vegetables you are eating is to “do a little planning ahead of time in packaging things in single-serving sizes so they are easy to eat,” Kundrat said. She suggests keeping grapes, berries, melon, citrus fruits and carrots available for snacks or meals. Kundrat suggested keeping canned and frozen vegetables on hand, as well as fresh, so you always have something to use if you run out of fresh or if the fresh vegetables have gone bad. And for vegetables on the verge of spoiling, she advised chopping them up right away and freezing them, to be added later to a soup, stew or pasta dish. Her skillet recipe includes green peppers and corn, and they could also be added to a boxed meal, such as Hamburger Helper. Another thing to think about when trying to cut back or eat more healthfully is watching portion sizes. “Whatever (portion) the main dish is, eat the same amount of fruits and vegetables,” Kundrat said, adding that they will satisfy the appetite of most people. “If in a dessert they’re getting bananas and apples and yogurt, they’re getting protein and calcium and fiber and potassium. They’re getting vitamins and minerals. And they’re getting enough Snickers bar to make it taste good. 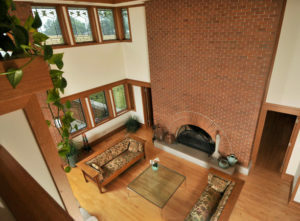 An Arthur home is inspired by Frank Lloyd Wright's designs. 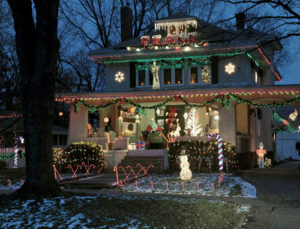 This Tuscola home is known for its outdoor light display.